LAS VEGAS, May 2, 2017 /PRNewswire/ -- Jive Software, Inc. (Nasdaq: JIVE) today at JiveWorld17 announced a partnership to resell TemboSocial's Surveys, Forms & Polls Add-on with Jive's Interactive Intranet and Customer Community solutions. 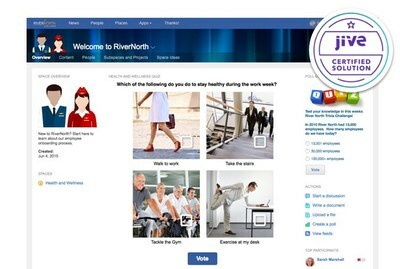 Already driving engagement for joint customers like Faurecia, Scotiabank, Tampa Bay Lighting and Viavi Solutions, TemboSocial's feature-rich solution makes it easy for businesses to collect feedback and test knowledge across internal and external audiences via a seamless integration with the Jive collaboration hub experience. "Our shared customers have proven again and again that collecting and analyzing information and opinions from their employees, customers and partners delivers real business value," said Jeff Lautenbach, president of worldwide field operations at Jive Software. "The integration of TemboSocial's sophisticated feedback gathering and testing products with Jive's collaboration hub solution equips large enterprises with the tools they need to increase engagement and gain insight into their customers and employees." Rich content – Users can engage and inform audiences with multi-question, image-filled, 'Buzzfeed'-style polls and surveys. Easy-to-configure learning modules – Users can test knowledge through quiz scoring and instant pass/fail messages. Integrated experience – TemboSocial tiles can be easily embedded to share surveys, forms and polls directly on collaboration pages, and capture responses within users' Interactive Intranets and Customer Communities. Multiple participation options – TemboSocial Surveys, Forms and Polls can be configured for anonymous participation or automatic collection of Jive profile data (name, email, department, etc.). Detailed reporting & analytics – Content owners can analyze real-time results right from Jive, with built-in filtering across questions, dates, geographies and languages. "Since adding TemboSocial's apps into our Jive communities, we've gained valuable insight into employee and customer opinions and sentiment," said Nicole Fuselier, director of digital strategy at Viavi Solutions. "Not only do we have full control over how TemboSocial's Surveys, Forms and Polls are configured, we can also segment audiences and deliver highly relevant content to the right people in the organization at the right time. This has been a great addition to our collaboration hub." "By working with Jive to create the most seamless intranet and community integration on the market, we're helping successful organizations all around the world make the most of their investment in Jive's collaboration hub solution," said Steven Green, president of TemboSocial. "Together, our solution will deliver important visibility into emerging trends and knowledge gaps, which helps marketers or HR people to ensure sustained customer and employee adoption, retention and productivity over the long term." To learn more about the TemboSocial Surveys, Forms & Polls Add-on for Jive, click here.